Meadow cake with edible animals. This is a Meadow Cake that was a recent request from my god-daughter for her 8th birthday. 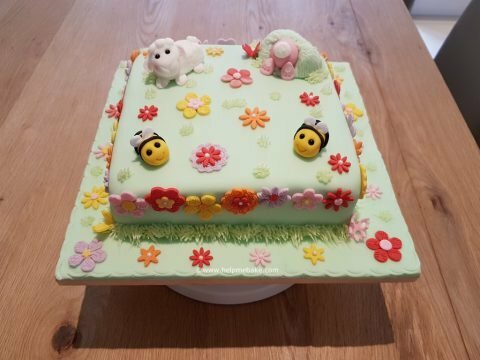 Meadow cake:- A small scene of a meadow that includes, flowers, insects, baby bunnies and lambs with green grass. I must admit that this is one of the most busiest cakes that I have done due to the amount of flowers on it but I have learned with kids that more is more and what they want they get so this was my interpretation of her requirements. The more I played with this one and built it up the more I liked it, it has colour definition, a laid back nature to it but has a vibrant edge that appeals to the youngsters. The cake was sponge, filled with buttercream and jam then covered in party green icing, it was surrounded by flowers made from Renshaws, orange, yellow, pink, red, purple and white icing that were then embossed using patterned mats and cut with numerous flower cutters. The grass is buttercream dyed with party green sugar flair concentrated dye and piped using a grass nozzle and the animals were made using normal icing, a little tylo powder and black pearls for the eyes. I must admit I had fun with this cake and was really please by the response I received…..and I quote…..
‘Tell Auntie Ang she’s brilliant, it’s amazing, I love it!’ ….out of the mouths of babes….you’re most welcome my darling, Happy 8th birthday Lois! I agree with your god-daughter Angie and I can see how it would appeal to an 8 year old, it is so vibrant and colourful, love it. Thanks Joan, the thing with this cake is the more I put on it the better it looked so I just l kept adding flowers to it until I ran out of space. Kids love colour!